WM Recorder record millions of video and audio files from the internet. 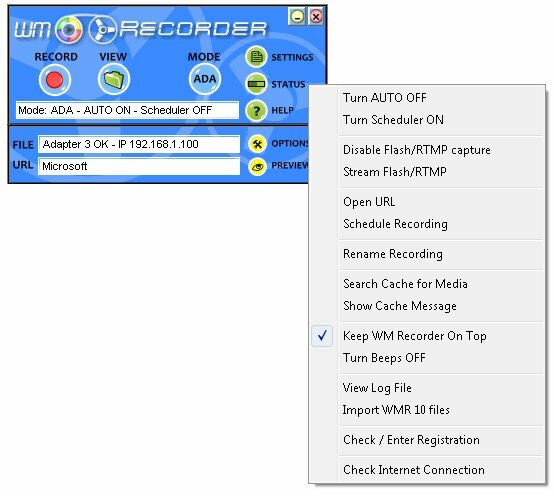 WM Recorder is a easy and powerful way to record millions of video and audio files from the internet. Just open this software to, play your video or audio, and it's saved automatically. Record Every Popular Streamed VideoFormat - Automatically! The software is a easy and powerful way to record millions of video and audio files from the internet. Just open the software, play your video or audio, and it's saved automatically. Please note: This software does not support Adobe Secure RTMP Measures. If it can't be recorded with WM Recorder, try WM Capture, which will capture video from ANY site. Since the software captures the identical data that is sent to your PC, your recordings are saved as perfect reproductions of the original stream. This results in media files on your PC that are of the highest possible quality. You can watch or listen anytime you like, even without an Internet connection. * Built-in Scheduler * Turbo Recording - record streams at up to 5x speed. * Works with slow dial-up connections. * Split and merge recordings. * Watch multiple videos at once with WM Player. * Watch commercial free from some popular TV/Movie sites. * Requires Windows Vista, XP, 2000, 98 or ME. Intel Macs with Parallels. * Supported Transport Protocols: RTMP, RTSP, HTTP, MMS. * YouTube™ and 1000s of other Video Sites.